The purpose of this lab is to give you experience in using some error prevention techniques of C++. You can create your own error checks and print error messages, but C++ also provides a way of capturing unforeseen errors. The try-throw-catch blocks are ways to handle errors. We put a try block around some code that might produce a foreseen or unforeseen error. For errors we know to check for, we can “throw” an exception (which basically means send an error to a “catch” block. It is also possible to set up catch blocks for unforeseen errors like dividing by zero or a user entering letters when we are trying to enter actual numbers. This Exercise looks at the first type of error. We will create a class named Contact that contains the full name, phone numbers and email address of a person. We could make a contact list from our Contact objects. We will check that a name starts with a letter. We will check phone numbers for being 10 digits and only containing digits. We will check that the email address has at least one and only one @ sign. Input will come from the keyboard user. •	a Word document that contains the project code and screenshots. Name your project: CIS247_Exercise7_YourLastName. For this exercise, you may use a header file or one file for the whole project. Purpose: Demonstrate using error checking and throwing errors from your setters to prevent some types of input errors. In coding the class, the default constructor should set all string variables to “unknown”. We will not use a constructor with parameters this time. The printContact() method should print out the name, phone numbers and email address with titles. Code the getters as usual – return the attribute value. See below for coding the setters. The setter will check that the name does not start with a number (digit). I know some names end with numbers so let’s just do this simple check. Use a try block. Test that the first letter of the string is not a digit (use the isdigit() function). If this first letter is a digit, throw the first letter. If not (else), go ahead and set the fullName to the parameter. The catch block will catch the character thrown and print an error message saying that names cannot start with a number. So if the error is thrown, the name will remain “unknown”. Since there are two phone numbers, we will write a special function that can be used to check phone numbers. The function could be named something like checkNum(). This function will return a bool (true if the number is OK; false if the number is “bad”), and it needs one string parameter because you need to pass the phone number to be checked. This function can be private. Put your error checks in a try block. We will check first that the string is 10 characters long (assume no hyphens or spaces). You can use the length function, that is, the length of a string variable named x would be x.length(). If the string is not 10 characters, throw a number such as a 10. Then use a for loop to check if all characters in the string are digits. If you find one that is not a digit, throw a number such as 0. The catch block will catch the number and check it to print the appropriate error message. After printing the error message, return false. If you get past the catch block, that means the phone number was OK so return a true at the bottom of the function. In setHPhone() and setCPhone(), you can check if the call to checkNum returns true or false. 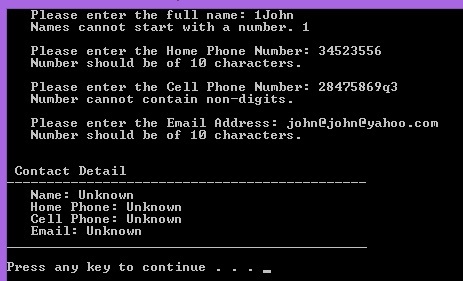 If you get true, then set the phone attribute equal to the parameter; otherwise do nothing and it will remain “unknown”. In the main function, declare a Contact object. Declare some string variables for the name, phone numbers and email address. 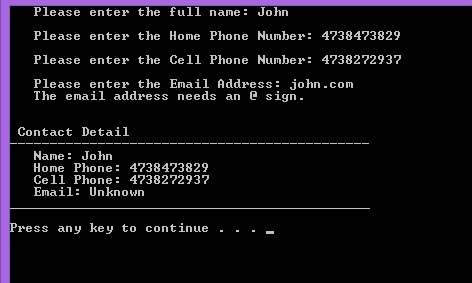 Display prompts to the user to enter their full name, home phone, cell phone and email address. Use getline to get the strings into the local variables. Then use the setters and pass the local variables. Finally display the Contact information using printContact(). A name that starts with a digit. A phone number that has some letters in it but is 10 characters. An email address with no @ sign. An email address with more than one @ sign. Create a Microsoft Word document called Week 7 Lab. At the top, put your information, including your name, course, Week 7 Lab, and the date. Put the file name for each file in the Word document below the screenshots. Bold the file name, and increase the font. Copy and paste the code for each file below its file name. You should have nine files for your project.